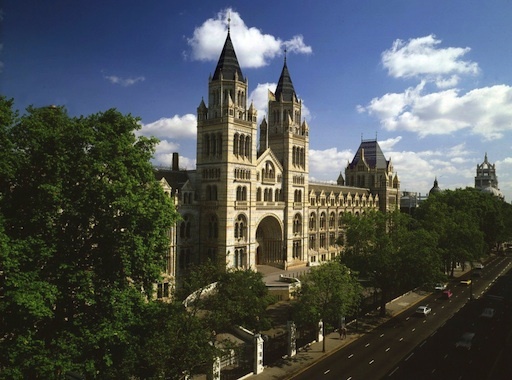 The conference took place at London's Natural History Museum, located in South Kensington. Participants were welcome to enjoy the exhibits at the museum during breaks (entry is free). The venue lies close to several other museums (e.g. Science Museum, Victoria and Albert Museum, all with free entry) and Hyde Park. Several other London attractions, e.g. the Houses of Parliament, West End, are just a few minutes away by underground. The closest underground station to the Natural History Museum is South Kensington. The museum's entrances are a few minutes from the station. See the map above and the NHM Access Guide for more information on how to reach the Natural History Museum. FSE 2014 talks were held in the NHM's Flett Theatre. 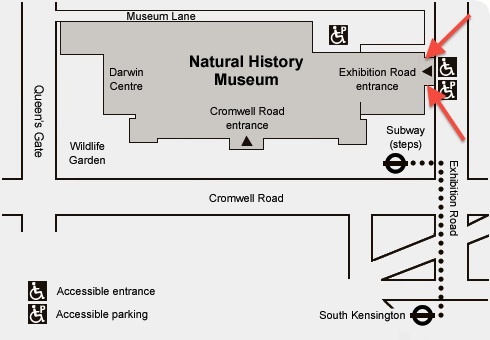 To reach the Flett Theatre, FSE 2014 participants should use the museum's entrance located at the Exhibition Road (NOT the main entrance at Cromwell Road); see the diagram below and here for more information. The workshop theatre is located on the first floor (there are information signs at the Exhibition Road entrance). Lunch is held in an adjacent gallery. You can check the museum's floor plan to help you locating the main areas and attractions in the museum (the Flett Theatre is located on Floor 1 in the NHM Red Zone).